Structurflex has been at the cutting edge of truck and trailer curtain innovation since the curtainside revolution began in the 1980s. It had the experience of working with PVC and the design and marketing nous necessary to pick-up on the new technology and run with it. The company, based in Henderson in West Auckland, makes a range of curtain systems and patented curtain tensioners that are used widely in New Zealand, Australia, Southeast Asia, and even exported to Great Britain. 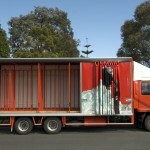 It also supplies a full range of curtainsider hardware. Robinson Roller doors and its new product, the Whiting Roller Door. “We started making truck curtains in the 1980s and have been making them for 25 years,” says Structurflex business development manager Simon Higgs. Simon is a customer relationship specialist with finance and economics degrees and experience in corporate banking before he joined Structurflex. Structurflex can trace its origins to 1937 when Leo Bouzaid set up Sails and Covers Ltd to design and make sails and other marine products for Auckland’s yachties. In the years immediately after World War 2, Bouzaid was quick to realise the potential of new technologies including PVC (polyvinyl chloride) fabric. In 1950, Bouzaid bought New Zealand’s first high-frequency PVC welding machine. After Leo’s death in 1962, his sons, world champion yachtsmen Tony and Chris, took over and developed the polymer fabric side of the business substantially over the next 20 years. The experience the company gained with polymer fabrics would prove invaluable when it began making truck and trailer curtains. In 1970, Sails and Covers Ltd joined forces with the US-based Hood Sailmakers Inc which took a 50 percent interest in the company which became Hood NZ Ltd. In 1981, Structurflex was formed as a subsidiary, focusing on the design and manufacture of truck covers, marker buoys, railway wagon covers and flexible containers and then became involved in the curtainside revolution. It moved to a purpose-built factory in Henderson in 1987 and in 1992, lodged a patent application for the Tensioner 3 which Simon Higgs describes as a breakthrough for fabric and curtainsider tensioning devices. Current managing director Murray Higgs bought Tony Bouzaid’s shares in Structurflex in 1993, joining the company as marketing director, focusing increasingly on international opportunities. He has a background in engineering, economics and accountancy and has worked with leading New Zealand exporters… He was New Zealand’s Trade Commissioner in New York for five years from 1974. Murray’s push into exporting saw Structurflex selling curtainsiders and truck curtain hardware to Malaysia, and in 1996, the company signed a joint venture agreement with Malaysia’s Tan Chong Motor Holdings. A year later they began manufacturing Flexisider curtainsiders in Kuala Lumpur. In New Zealand, Structurflex has been supplying curtains for truck and trailers since 1983. 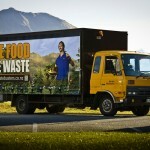 It also introduced digitally-printed truck and trailer curtains to New Zealand. There are three curtain types, Flexisider, Slide-A-Side and Citysider. Flexisider curtains allow operators to access a load from anywhere along the entire length of the vehicle, eliminating first-on last-off planning problems and making loading and unloading easy and fast. Structurflex says Flexisider curtains provide complete cargo protection and security, and significant tare weight savings. Insulated and super-insulated Flexisiders are available for vehicles carting chilled or frozen cargo. Structurflex makes Flexisiders in Dryfreight (single skin), Double Skin, Standard Insulated, Super Insulated and Chipsider versions. Its Slide-a-Side curtains combine the ease of sliding doors with the loading benefits of side curtains. Designed especially for the distribution industry, they are well-suited to multi-drop operations. Slide-a-Side allows a truck or trailer to go from open to closed in five seconds with one smooth manoeuvre. There’s no cleating, buckling or roping. It has the added security of sliding doors, and its alloy construction and lightweight walls offer significant tare weight savings. The Citysider is a hybrid, combining the speed of the Slide-a-Side with the loading flexibility of the Flexisider. It uses the rigid sliding end panels and over-centre catches of Slide-a-Side, but keeps the Flexisider buckles and straps, so that operators can load the truck from anywhere on the side, and retain the full load-capacity without the restraint of a captive bottom curtain edge. Structurflex introduced its Tensioner 3 in 1992 and lodged a patent for the device. The lightweight tensioners make it easy to tighten or release truck sides with one hand. Made from highgrade metal castings, they’re exceptionally strong and durable without being heavy or bulky. Tensioners can be fitted to both ends of a Flexisider curtain, and have been used for 20 years in New Zealand, Australia, Malaysia and other countries. Structurflex stocks extensive spare and replacement parts, including curtainsider components and curtainsider tracks. The catalogue includes tracks, pelmets, luff groove poles, pole top caps, pole base plugs, pole support brackets and spacers, washers, hooks, buckles, webbing straps, bearing rollers, hangers, top rollers and brackets, door and pole bottom guides, centre catches, door brackets and parts for the Structurflex Tensioner. The company has also been involved in projects to design and develop custom-designed curtains to meet special requirements. Exports are an important part of Structurflex’s business. “In 1997 we set up a truck curtain manufacturing factory in Kuala Lumpur, and we pioneered the curtainside market in Malaysia,” says Simon. “We export to Japan and Taiwan but they are small markets and we sell into the Pacific Islands. We’ve sold a few curtainsiders in Fiji, and our office in Malaysia sells to Indonesia, Thailand and Singapore.” Structurflex is also a major supplier of roller doors to the transport industry, and distributes two brands, Robinson and Whiting. American-developed Whiting Roller Doors are the most recent addition to Structurflex’s product range, and were showcased at the Truck and Heavy Equipment expo at Mystery Creek, Hamilton, in March. Structurflex began selling Whiting doors in late 2011 and installed the first one, a Hinged Truss II, that November. Whiting is a well-established US company which began making the doors in 1953 when a customer called into the yard of a small garage door manufacturer in Akron, a town near Buffalo in upstate New York. 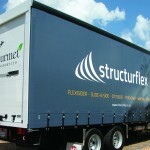 Structurflex had the vision and the technical capability to embrace the new curtainside technology in the early 1980s. Structurflex also markets the Robinson Roller Shutter, a lightweight aluminium door which it custom-makes to fit individual trucks. The doors effectively seal against road dirt and water, are easy to open and shut, and their flat surface provides a suitable background for graphics. The doors’ alloy slats come in two sizes, 57mm for standard applications or 34mm. The latter has a tighter roll for smaller compartments. The 34mm alloy heavy-duty slats have nylon seals at every joint. Robinson doors are used on the side of trucks and at the rear on smaller trucks. Higgs says that Structurflex is regularly looking at truck curtain design and is always interested to hear from customers with ideas for design development in the future. He says Structurflex’s market share is improving with the help of its new transport salesman. David Lyon. “He’s helping us to fight for market share.” David’s father, Reg, worked for Structurflex from the late 1980s until 2002, and was instrumental in establishing the curtainsider market. His efforts earned him the nickname, Mr Curtainsider. David started with the company in 2011, and brought with him extensive transport industry knowledge through running his own transport company. He’s also involved with planning production in the Structurflex factory. Structurflex had the vision and the technical capability to embrace the new curtainside technology in the early 1980s, and the drive, innovation and imagination to capitalise on the revolution. And it established itself as a key part of the NZ transport industry. “Nowadays, we get curtain orders every day,” says Simon Higgs. “And our factory, custom-designed for fabric fabrication, can manufacture a large volume of curtains.” It’s a classic example of forward-thinking and hard work paying off handsomely.